Mast seeding is defined as the highly variable production of fruit by a population. These intermittent pulses of food resources drive ecosystem-level functions and forest dynamics.The difference between a mast seeding year and a non-mast seeding year can be thousands of acorns, hickory nuts, beech nuts, etc. Mast seeding dominantly occurs in wind-pollinated tree species. Well, so it turned out to be, but never did I expect it to be as big an event as has eventuated. 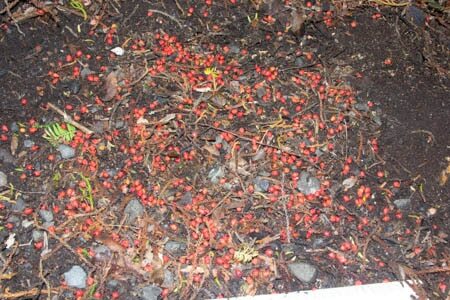 Each trip to Ulva has shown more and more Rimu seed on the forest floor. But a gale a couple of days ago really showed me what a big mast can be like. On a previous mast year I had counted around 200 seeds in a 1 metre square, and though that was pretty amazing, but this year seemed much better. So yesterday I went over to Ulva on my own, and set up a 300mm square (a metre square would have been too difficult to clean and photograph). After carefully removing all the leaves and general litter I took a couple of photographs, rather than trying to count manually …. these seeds are tiny. Picking each one up, and counting, and then throwing out of the defined area did not appeal. I blew the resulting photo up on a big screen, used a paint program to blot out each seed as I counted and came up with an astonishing 525 for a 300 mm square. So between 4 and 5 thousand per metre square. Now to be fair that does not mean that each square metre on Ulva Island has 4 to 5000 seeds in it …… half of all the Rimu are males, and therefore no seed. And of course not all females are so fecund. 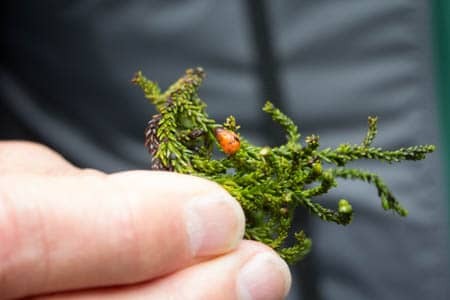 But it still adds up to a quite mind boggling amount of food on the forest floor. the seed itself is the tiny black dot at the upper left corner of the red fleshy part. 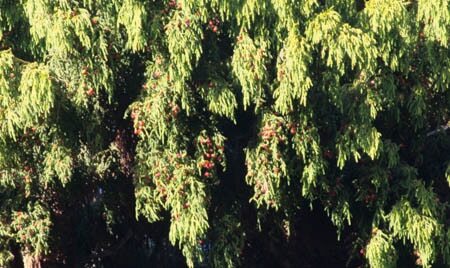 And although Rimu seed are very small, they appear to have a high energy level ….. I have my guests try them, and all remark on the sweetness. Add to the Rimu mast the heavy fruiting of other forest species and our fruit eating birds really are in clover. Kakapo especially tie their breeding to Rimu masting, and DoC are hopeful of an exceptional breeding year. Sadly, there will be a down side to all this abundance. Rats of course are also beneficiaries of this high energy and abundant food, and their population will explode. The piper will need to be paid when the food is gone and the starving rat population that is the result of the huge food resource will turn to everything else. 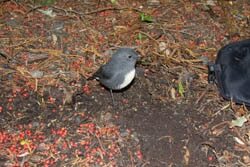 It will be an issue for our forests and birdlife and DoC are planning for it. It will also be an issue for homeowners, as both starvation and winter weather drives rats into our homes.